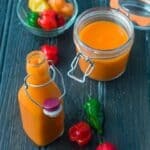 Using a blender or food processor, individually puree the carrot, bell pepper and scotch bonnet peppers. Use a splash of water if needed to assist with breaking down the vegetables. Add the onion, scallion and garlic together in the food processor and puree and add that also to the same skillet. As the ingredients start to splutter, decrease to low, add the pink salt, coconut sugar and the lime juice, cover the skillet with a lid and simmer for 20 minutes but stir frequently to ensure the ingredients don’t stick. Add a splash of water if the vegetable puree proceeds to stick. Allow to completely cool down.